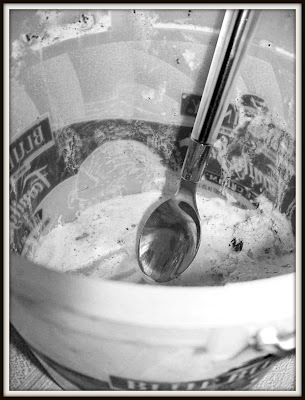 This, my friends (attacking a humongous tub of cookies and cream ice cream with a spoon), is a bad idea. But, really, I have an excuse - a pretty good one - for my reckless behavior! I know I promised that I would try and limit my references to winter and cold and ice, but OH MY GOSH! It is SNOW, SNOW, SNOWING again. Ten inches are expected. All you can see out our window is white. All you can hear is the wind howling and the sound of my children's fingernails clawing at the walls - oh yes, and my teeth chattering. We are dry and all static-y. The kids are red cheeked and pale. We try and forget about bike rides and tire swings by playing dress-up, dancing in the living room and making treasure maps. I try and compensate for my atrophying muscles and lack of vitamin D by, sh-h-h-h (its a secret), mindlessly snacking (for the record, I've never pretended my plan was logical). Homeschool co-op has been canceled for tomorrow (Wednesday) because of...you guessed it, yet another blizzard. Quick! Hide my jelly beans, the tortilla chips and animal crackers! Grab a blanket my darlings, find the Winnie the Pooh book (what a fantastic read!) and let us pass another day all curled up and cuddled together, dreaming of spring. Oooo, Dairy Queen sounds good.